I present this mainly photo blog as food for thought – or maybe just for fun. 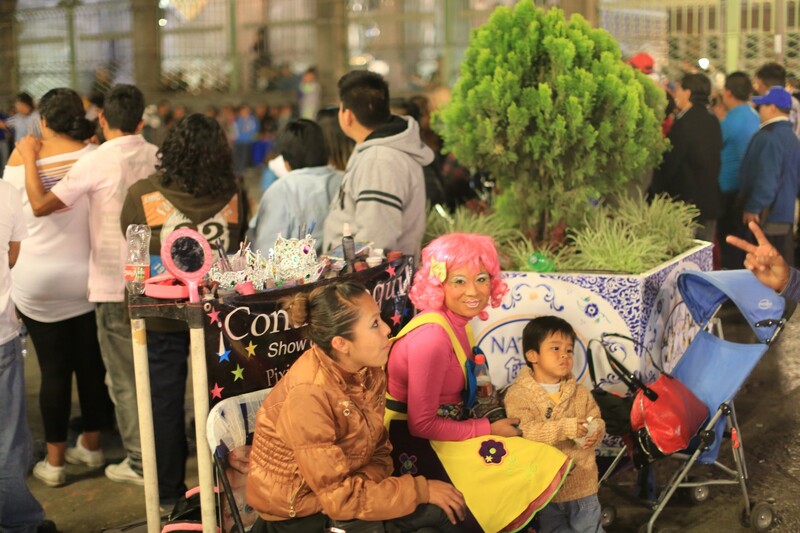 The pictures here are just an average Sunday night in Puebla, Mexico (the 4th largest city in MX). I can’t help but think of that song by the band Chicago “Saturday In The Park” (Think it was the Fourth Of July). 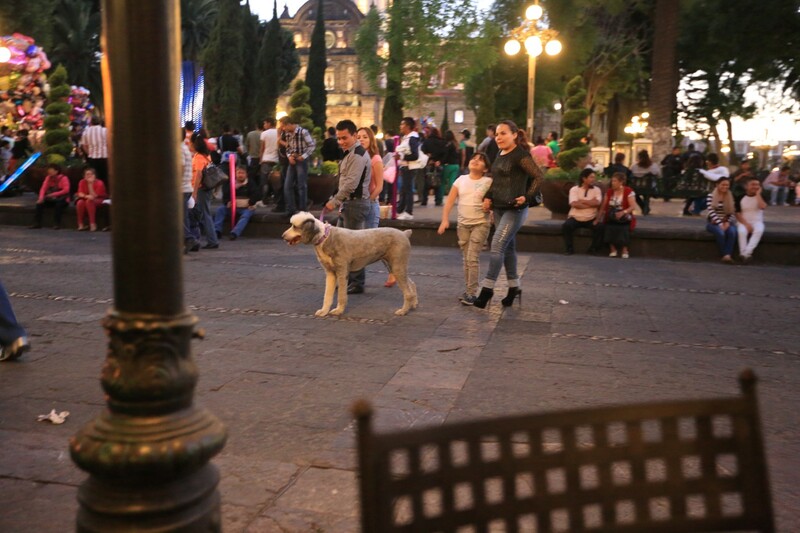 Contrary to a lot of ideas, Mexicans definitely treat their dogs as family members. Not in all cases, but very frequently. 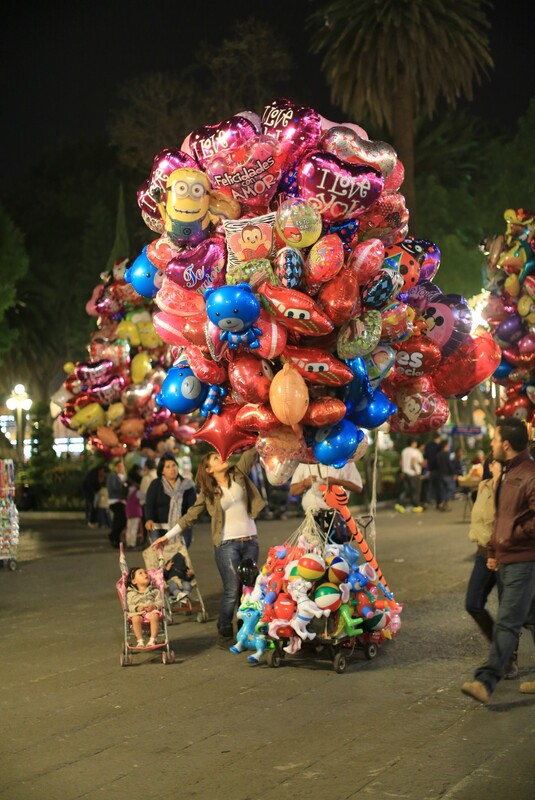 This is the Zocalo, these are Mexican families – strolling, laughing, buying balloons …. 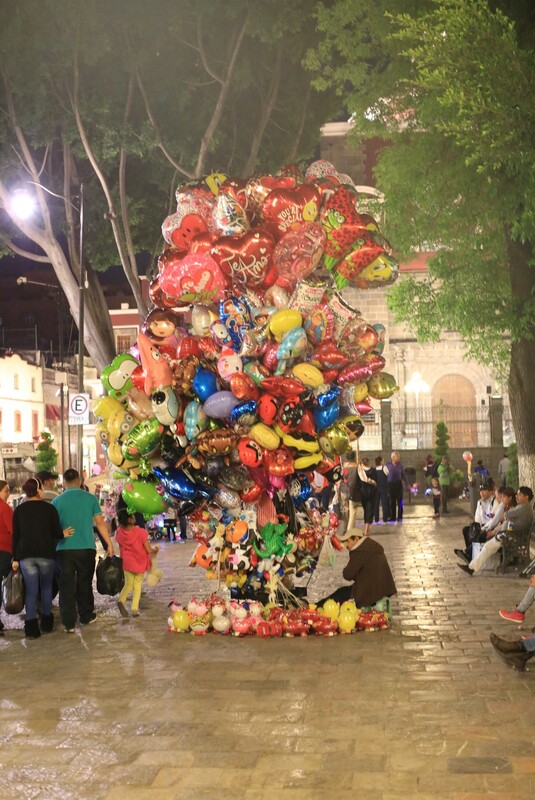 SELLING balloons, watching street performers, laughing, looking, eating, enjoying …. When I was out there watching all of this happen, grabbing my camera, snapping some memories – I was thinking “Hm – why isn’t it like this at home in America” and I walked around thinking – wow – there’s something going on here that we’re missing. It wasn’t until I came back home and started thinking about Balboa Park on the weekend, or the boardwalk in Mission Beach, or Washington Square Park in NYC in the summer, or the Park in Chicago for the summer that I got to spend there …. 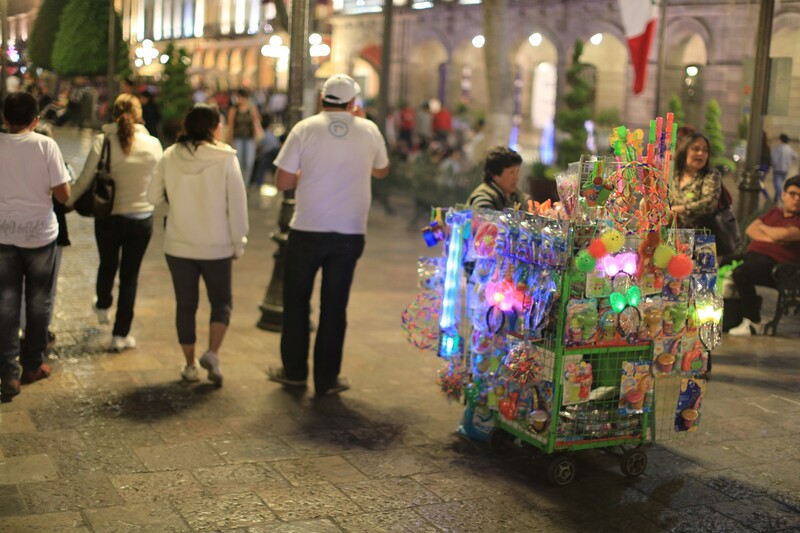 Mexico sure knows how to light up their cities though! 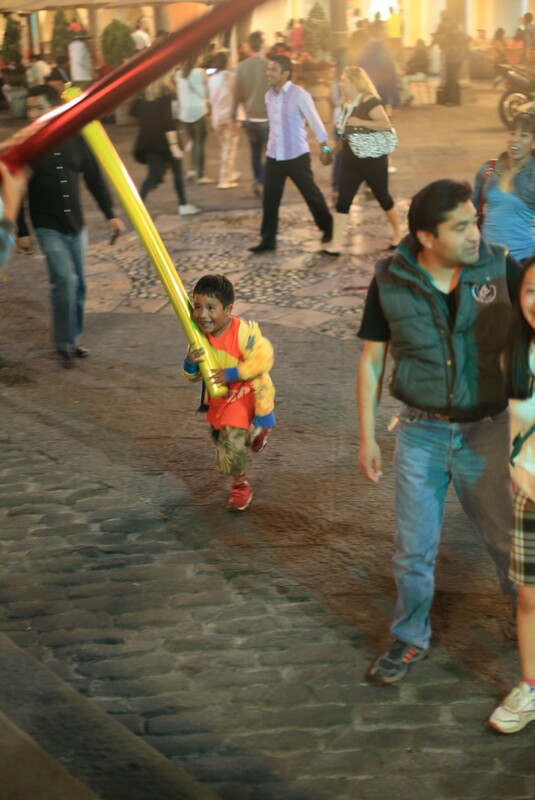 The Pencil Balloon – hard to describe the joy. “Stairway to Heaven” is the #1 classic rock song of all time. No one knows exactl why. The Pencil Balloon is a toy that apparently is the very best thing ever. Ditto. 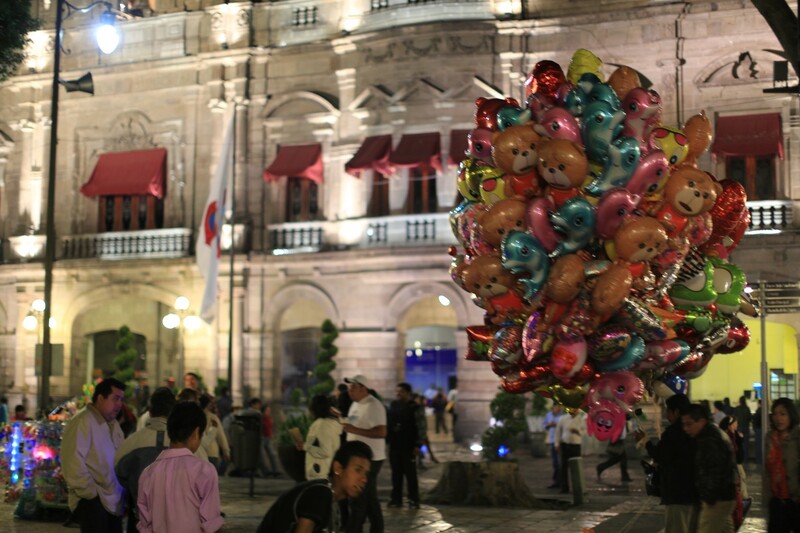 It’s a different kind of national pride than in America – but Mexicans are very proud of who they are. There is no danger going on in this picture. your writing about how you realize families there are just wanting the same things as families everywhere reminds me so much of the words of “Finlandia” (Kate might remember it from hearing it at camp. or google it sometime). it is a realization that more people need to have! maybe it would help break down the US and THEM mentality! That was a lot of fun. Glad you’r enjoying yourself while waiting for things to get straightened out. Think how much worse it would be if you were sitting twiddling your thumbs and getting agitated which a lot of people moght be doing in our situation. Hope the car is done soon. Hey Mark and Katie! Sorry it took me so long to get onboard the curious adventure tour, I just got the blog url form Michelle. I’ve gone through all of your post and so far I’m having a lot of fun living vicariously through your adventures. I’m really happy to see you gaining so much perspective on so many different things. 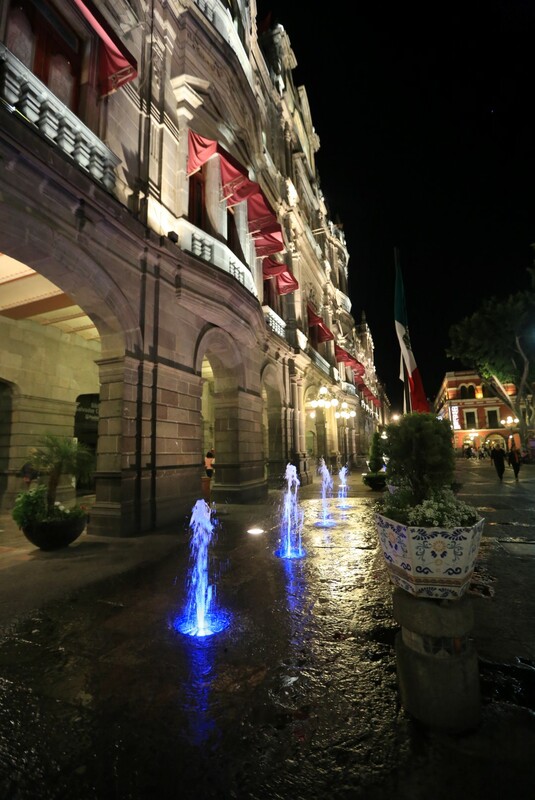 Reading the way you describe the familial atmosphere in Mexico reminds me of my Grandparents and how they used to always stress how important family is in our culture. Safe travels can’t wait to see the next set of pics and thoughts.